1) A bill to give the FDA the power to regulate tobacco recently cleared its first legislative hurdle. As we wrote last August, FDA oversight would be another step toward complete tobacco prohibition and may mean substantially limited advertising of cigars in magazines (and also potentially on websites such as this one). 2) If you like to smoke and gamble, Atlantic City will soon be out but casinos in Iowa will still be in. On Tuesday, Iowa Gov. Chet Culver is expected to sign a statewide smoking ban that will go into effect on July 1 and include an exemption for casinos. 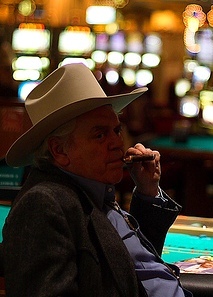 Wednesday, however, Atlantic City officials voted to ban smoking on all gaming floors. 3) Inside the Industry: The Newman Cigar Company opened its second Diamond Crown Cigar Lounge in Corona Cigars in Orlando. Gene Richter, formerly of the Coors Brewing company, is joining General Cigars as vice president of sales. EO Brands, maker of the 601 line, has introduced 601Rewards, where customers can redeem 601 bands for items ranging from a 601 T-shirt to a 42 inch hi-def flat screen TV. 4) Around the Blogs: Cigar Jack checks out an El Titan de Bronze Redemption. Cigar Beat inspects a Tatuaje Havana IV. Velvet Cigar smokes a Padilla Obsidon. Stogie Review reviews the Defiance by Xikar. 5) Deal of the Week: A great way to try the new Hoyo de Monterrey La Tradición is this deal. For only $19.99 (including free shipping), you get four Tradicións and a Don Tomás sampler pack with three different blends. At less than $3 a stick it’s a real bargain. Get yours here.